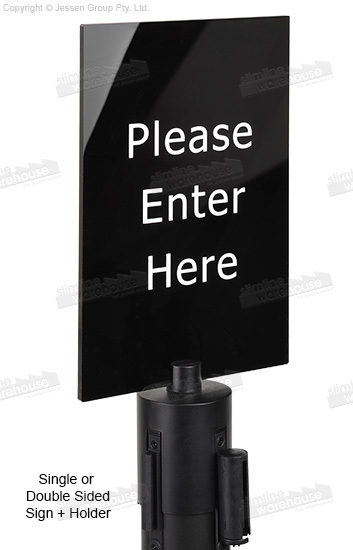 These barrier signs, also known as crowd control systems, include a signage holder that attaches to the top of a queue post with ease. 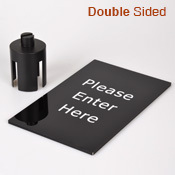 No tools are necessary to put this topper on a stanchion without stopping access to the retractable belt or connectors to still easily create a queue or section off an area. The top of the sign holder needs only an allen wrench to securely put the included sign in place. 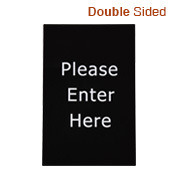 The barrier signs have a 277 x 178mm sign that is made from black acrylic, offering a durable display that makes the white lettered sign easy to read. The commercial safety stanchions are able to be used in retail stores, shopping centres, train stations, banks, exhibition halls, doctor offices and more without issue. The message inscribed on the sign reads "Please Enter Here" on one side to help show visitors where to go as they enter your establishment! Click here for access to our vast online catalogue, with hundreds of different items available for you to purchase that are made of high-quality materials & sold at prices not found anywhere else online! Slimline Warehouse has been a leading supplier of POP, POS, retail, & exhibition displays for over 20 years. Orders paid prior to 1pm EST will despatch to Adelaide, Brisbane, Melbourne, Perth, Canberra, Sydney, & anywhere else in Australia same day with most in stock items!